Kanga® Waterproof Pants offer the very best security and comfort for people with any level of incontinence. Plastic pants are nothing new. They have been used for a long time to help with incontinence issues. Traditionally they have been used with cloth nappies as a waterproof barrier. 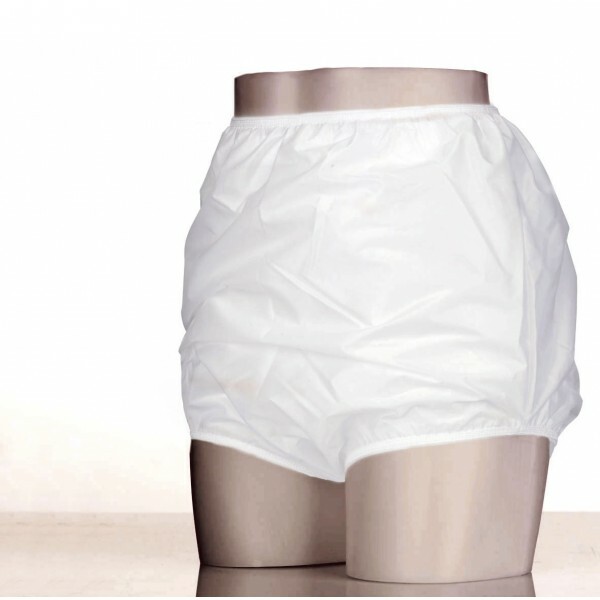 To call Kanga® Waterproof Briefs plastic pants would not be accurate. They are actually made from a very thin and lightweight waterproof nylon material. They are not like the noisy, bulky pants from years ago. They are slimline, with better leg and waist cuffs for added protection. The material is soft and quiet. These are not plastic pants. In years gone by the leg and waist cuffs had to fit very tightly to the skin to form a waterproof seal. This led to discomfort and rashes as the elastic would sometimes dig into the skin. The elastic material in Kanga® Waterproof Pants is different in that it is softer, and wider. This means you can get the same level of protection without the discomfort. Kanga® Waterproof Briefs are reusable and washable. The exact technology that Kanga® Waterproof Pants use is called Polyurethane coated or laminated Nylon. Polyurethane is a flexible, breathable, waterproof material that is very soft, fully waterproof and comfortable. Only the very highest quality waterproof pants use polyurethane coated nylon. The difference between this and the standard PVC type is incredible, you will never go back to standard PVC pants after trying these. Some people with incontinence issues prefer not to wear any absorbent incontinence products, whether washable or disposable. They might find them uncomfortable to wear or worry that the product will show under clothing. These people can choose to wear Kanga® Waterproof Pants over the top of their normal underwear to protect from occasional leaks. The product is so lightweight, thin and quiet that you can easily slip them on over your usual underwear and go about your normal day. Although the pants don’t offer any absorbent protection, the waterproof material should keep leaks contained until you have time to change. If you are going on holiday, staying in a hotel, likely to be on a long plane or coach journey, or just don’t know where the next toilet will be you can use Kanga® Waterproof Pants to pull on over your normal incontinence underwear as an added layer of protection. If your normal product is full and begins to leak, the Kylie® Waterproof Pants will keep your clothes dry and prevent any embarrassment. Many people feel a boost in confidence, knowing they have this extra protection, even if they never use it. Some people with urge or functional incontinence choose to use Kanga® Waterproof Pants for those moments when they might get caught short. If you wear adult nappies or pull-up pants to bed, you might find that they sometimes leak. Lots of people choose to put on Kanga® Waterproof Briefs over the top of their nappy or pull-up pants to help contain leaks. They can help you get a better night of sleep, and to keep the bedding and mattress dry. The high waist line and soft, comfortable leg cuffs stop urine leaking out, and the pants are designed specifically to be loose fitting, so there is plenty of space to accommodate even the most absorbent nappy or pants. These pants are the best way to get the most out of disposable products. For bedwetting, these plastic pants are comfortable enough to wear every night, and give you the protection you need to enjoy a good night of sleep. For people with double or faecal incontinence, they will appreciate that the waterproof layer and elasticated leg and waist cuffs don’t only contain urine, but also faeces and odours. Even if you are confident that your incontinence product won’t leak, the added odour control is very important. With Kanga® Waterproof pants you don’t need to stop doing the things you do such as meeting your friends and enjoying social occasions. The Kanga® pants will safely keep odours contained.